A 1980’s era ranch style home in Commodore. 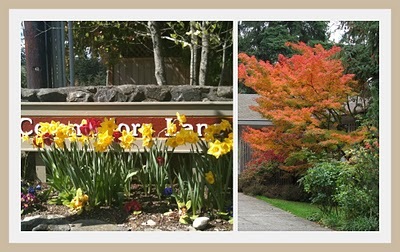 Well manicured lawns and mature native landscaping enhance the neighborhoods. Another ranch style home in Commodore. Love the fall colors, trees are abundant in this neighborhood. And another Commodore home. This is an updated custom home built in the 1970’s. Many of the homes have large daylight basements and homes can range in size from 1500 square feet to 3500 square feet. Now, moving into Commodore West, this is an early Chaffey home (above), built in the 1990’s, as is the home below. Further down you can see a typical cul-de-sac in the neighborhoods. With the larger .30 lots, home spacing is not as tight as some of the other in-town neighborhoods. 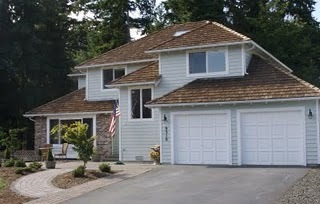 Moving further into the Commodore West neighborhood, the homes get newer, this one built in the 2000’s. 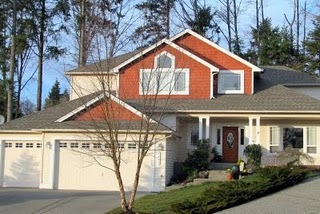 And, a brand new home by Chaffey, sold December of 2010. Between the two connected neighborhoods of Commodore and Commodore West, there are about 130 homes. The neighborhoods are connected by a foot path and the distinctive difference between the two are the age of the homes. Commodore (known to locals as Old Commodore) is just that, primarily homes built in the 70’s and 80’s and the homes line the West end of the high school. At the end of the 80’s Chaffey, a prominent builder in the North West, started developing in some empty lots and then expanded the neighborhood and created Commodore West. Homes were built in the 90’s-2007 in Commodore West, all but one by Chaffey. Two main roads, with no outlet, encompass the neighborhoods and cul-de sacs branch off the main roads, creating less traffic, which is good for small kids playing or riding bikes. Another appealing thing about Commodore is that it is adjacent to several schools. By foot, even on trails, kids can access Ordway and Odyssey, two of the elementary schools, Sakai (5th and 6th Grade), Woodward (7th and 8th grade), and the High School (9-12). This also means that soccer and baseball fields, the aquatic center, the library, and Safeway are walking distance too.Home sizes vary greatly and range from 1500-3500 square feet. Lots sizes are a big reason the Commodore neighborhoods are so popular. Most lot sizes are a third of an acre, putting a comfortable distance between you and your neighbors.